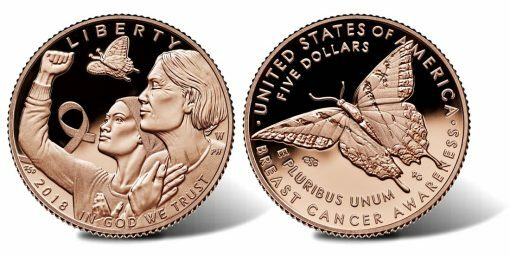 The United States Mint this week published images of the upcoming clad, silver and pink gold Breast Cancer Awareness Commemorative Coins. 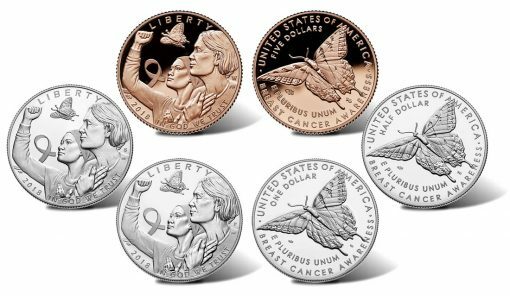 Launching on March 15 at introductory prices ranging from $25.95 to about $430, the commemoratives are minted in collector qualities of proof and uncirculated with each sharing the same Emily Damstra created designs. Obverses depict a butterfly, an older woman with her hands on her chest and a relieved expression on her face, and a younger woman wearing a scarf on her head with one hand over her chest and her other hand raised in a fist as if she is ready to fight. Reverses show a Tiger Swallowtail butterfly in flight, a symbol of hope. As mandated by their authorizing law (Public Law 114-148), surcharges of $35 per gold coin, $10 per silver dollar and $5 per clad half-dollar are included in each price. 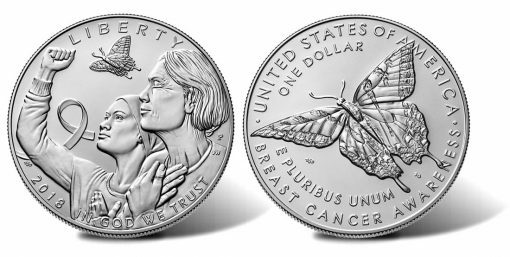 As long as the coins turn a profit, the collected surcharges will be paid to the Breast Cancer Research Foundation (www.bcrfcure.org) to further its efforts in breast cancer research. Below are larger images of the commemorative coins. Pink-hued gold coins are a first for the U.S. Mint. They are composed in 85% gold, 14.8% copper, and 0.2% zinc. 50,000 are authorized across all options. 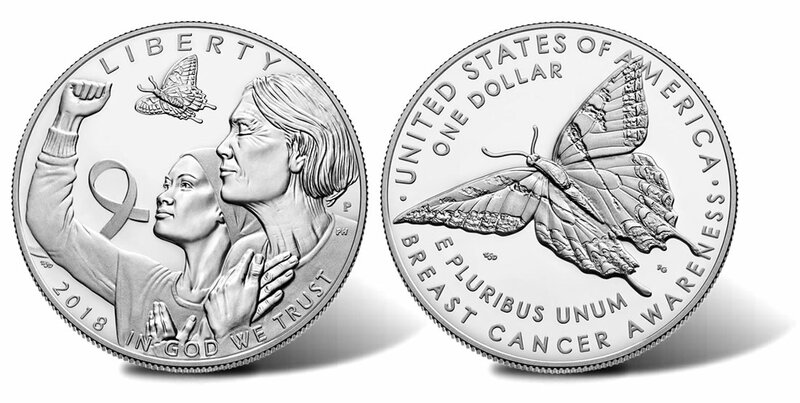 Each silver dollar is minted in 90% silver and 10% copper. The silver dollars are limited to a mintage of 400,000. 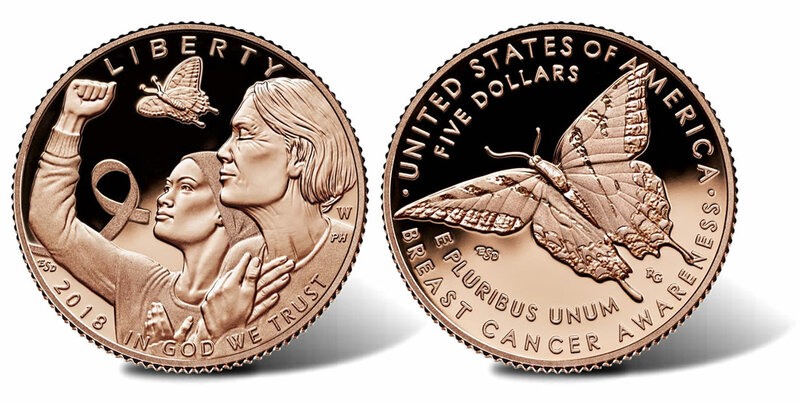 Commemorative clad half-dollars are struck in 8.33% nickel with the remaining balance copper. 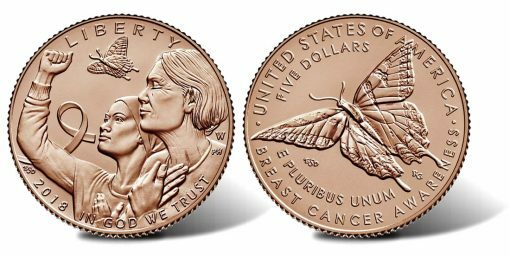 Up to 750,000 may be sold. 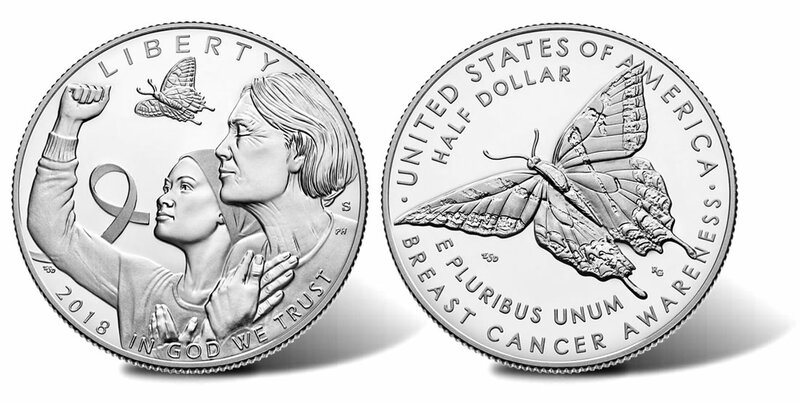 Phebe Hemphill sculpted the obverse design while Renata Gordon sculpted the reverse design. When released, the coins will be available at catalog.usmint.gov. Apparently the good stuff is readily available among the gummint employees in D.C., because whoever came up with these numbers just has to be smoking it. Been twenty-nine years, four months and eleven days since my last bud (grown) and my last Bud (brewed), so I will just pass a big smile around instead. Clean is the only way I’m keeping my human machine, body and mind. Never had a clearer head in my life than I do now; am able to think thoughts, have illuminations and experience epiphanies the likes of which I never even imagined before. The really big pain is the one in our own head that won’t stop telling us that somehow or other because we’re just not good or capable or smart enough we will forever fark up each and everything we ever touch, whether with our words or hands or intentions. If that persistently debilitating little demon could be silenced…. All I see is children commenting on this page. Stay classy. no-class!, to comeback, one-night,er, i*ll b waiting! even*outside*my*doors!smile*.